I received my dog tags at the United States Naval Training Center in Great Lakes, Illinois - otherwise known as "Boot Camp" - in February of 1970. After all these years, I still wear one of the dog tags on a gold chain around my neck. The other dog tag is on my key chain. And hanging from my desk lamp in my basement office and library is my late father's dog tags from when he was a U.S. Navy UDT frogman in WWII. So with my affection and respect for military dog tags. 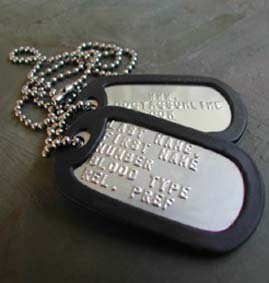 I was interested in reading a brief piece on the history of dog tags at War History Online.